Kendall Jenner is stationed in Paris for Couture Week, and after walking the Givenchy runway, she stepped out for some shopping. Rather than slipping into sweats, the supermodel opted to try the latest denim trend: wearing fishnets under a pair of jeans. According to Kendall, the look takes prowess. Pull your tights above the waistband of your skinnies and roll the hem to reveal your ankles. 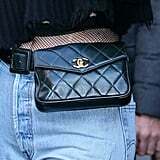 Kendall turned up the '80s vibes by completing her outfit with a cropped off-the-shoulder sweater, Krewe sunglasses, strappy Soebedar heels, and a quilted Chanel fanny pack. A touch of glamour came by way of a long furry coat, which worked to grab our attention, ultimately leading us to zoom in on Kendall's new layering trick. Scroll to get inspired, then shop your own denim and stockings combination.